Same snooker as in the one cushion escape, but you choose to try it off two cushions. First, find the mid point between the cue ball and the object ball. Draw a line from this mid-point into the heart of the corner pocket. Draw a line parallel to this line . 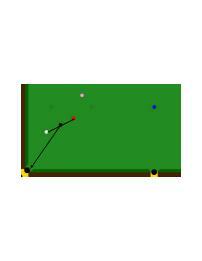 This is the direction that you need to roll the cue ball. The cue ball will rebound around the corner and into the object ball.